Engraved by John Dower. 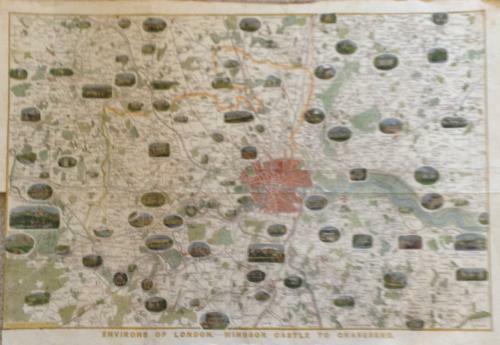 An extremely detailed map of the vicinity of London, as it was in 1855 when this map was published. Many vignettes showing scenes in and around London. Shows the roads, towns, villages, and cities, with a major street level map of London in the center. Very Large Folding Illustration Arrival Of The Emperor And Empress Of The French At Windsor Castle on the verso. In very good condition with the original margins (short on the lower left to fit into the book).